Measurement of the J/ψ elliptic flow as a function of transverse momentum pT in lead on lead ion collisions at the LHC. The bars represent the statistical uncertainties and the open boxes the systematic uncertainties. Theoretical calculations are shown as lines. The dotted lines represent the calculations without the J/ψ regeneration mechanism. The inclusions of this mechanism (solid lines) is necessary to reproduce the magnitude of the observed flow. In ultra-relativistic heavy ion collisions at CERN's LHC accelerator, a new state of matter is formed: the quark-gluon plasma (QGP). It is a kind of very dense and hot "soup" containing only the most elementary constituents of matter. A few microseconds after the Big Bang, the Universe would have passed through this state. Because of the interactions between its constituents, the QGP flows like a fluid. At the LHC, interactions between constituents of the QGP are so strong that even objects as massive as the charmed quarks are carried away by this flow, as suggested by the measurement of the flow of the J/ψ (particle composed of a charm quark and its antiparticle) of ALICE during the first campaign of the LHC (see highlight 2013). This result has just been confirmed by the ALICE collaboration using data from the new LHC campaign (2015-2018). The precision obtained suggest the need of including new mechanisms in the theoretical models. The Saclay group played a key role in analyzing this data. 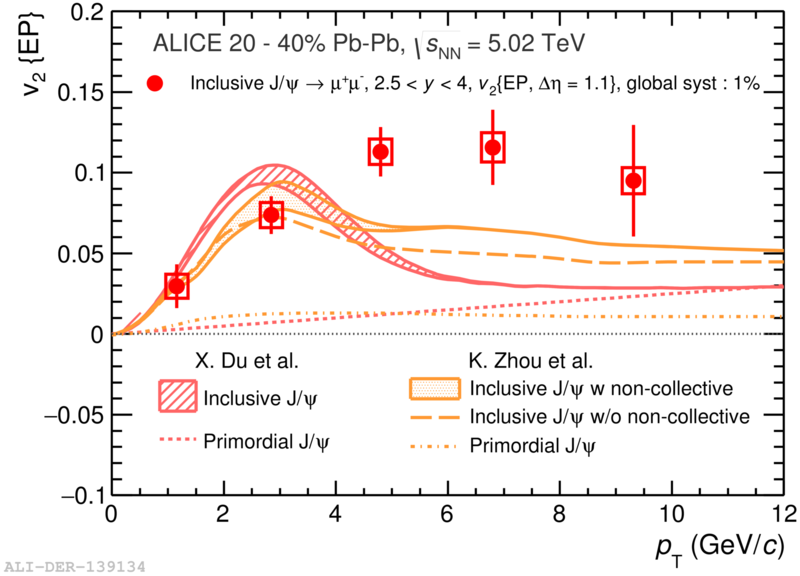 ALICE Collaboration, J/ψ elliptic flow in Pb-Pb collisions at √sNN = 5.02 TeV, Phys. Rev. Lett. 119 (2017) 242301.